I was a bit hesitant to re-read this book, since I have had a bit of bad luck when it comes to re-reads recently. In the end, I am glad I re-read it. What I like with Patricia Briggs novels is the detailed worldbuilding, and how she can take something and give it a fresh twist. This book, and the rest of the Mercy Thompson series, are no exception. 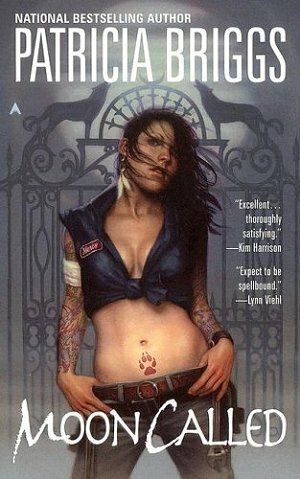 This book focused on the werewolves, but I liked how she introduced the other factions in the world, both vampires and fae. I liked how the werewolves in the US were ruled by the Marrok, and how he kept a firm but benevolent grip on the reins. It felt right, somehow. Despite the fact that I vaguely remembered what happened, I couldn’t stop reading. I held my breath, from the moment Mercy met Mac, to her search for Jessie and Adam. The plot moved at break neck pace, and I loved how the stakes gradually increased as Mercy and her friends they tried to figure out who was behind this. I’ll admit that there was times when I wondered if they would figure out who the villain was in time. Meeting the characters again felt like meeting old friends. I liked that Mercy a lot. She had a core of strength and confidence. And while she defied Adam a lot, she also knew how to handle werewolves, and when to keep quiet. I also liked her loyalty to her friends, and how she was prepared to do anything for them. I couldn’t find anything bad, the only thing that keeps it from getting an A is that I felt it lacked that something. * The blurb is from the UK edition, since I couldn’t find a proper blurb for the US edition online. Which drove me nuts. I hate when all I can find is a three line blurb. Avon launces the Avon Social reader.